A gambeson worthy of the outlaw that wore it. 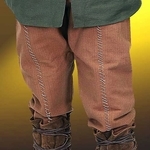 Heavy two-piece garment consists of a corduroy undershirt with padded and studded sleeves and a quilted sleeveless gambeson. Both pieces are chocolate brown corduroy. Gambeson also looks good with the Outlaw shirt. Accessories shown are sold separately.